Rigid heddle was originally invented for and used as a simple shedding device for weaving narrow bands, straps and trim. Today we know this as "inkle". The term "inkle" was first used in the mid 1500's and means "ribbon" or "tape". This is the stuff that held the world together until buttons and zippers were invented. It wasn't until shortly after World War 2 that the wider rigid heddle was developed and also as a beater to create larger cloth in a balanced plain weave†. The modern inkle loom came along just before that, some time around 1930. Warping is easy and fast on this type of loom so I can understand why it's so popular. People began to associate the weave structure (narrow warp faced plain weave cloth) with the loom, forgetting that anything that holds warp under tension is a loom and that any weave structure may be woven on any loom. You don't need an "inkle loom" to weave inkle (narrow warp faced plain weave cloth). I sold my inkle looms. I've decided to get back to basics and use the rigid heddle for its original purpose. The ancients had the right idea. I like to do a lot of pick up work. I've come to the conclusion that pick up work with the rigid heddle is superior to doing it on the modern inkle loom. The pattern threads, now spread further apart, are much easier to see and manipulate. 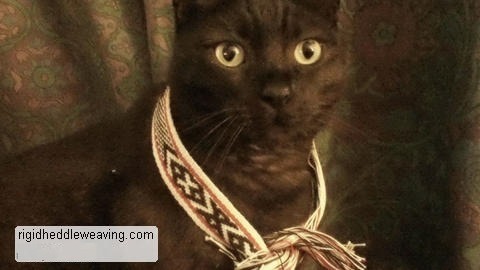 I think I'll use part of this band to make a collar for my kitty as it makes her look rather regal, don't you agree? 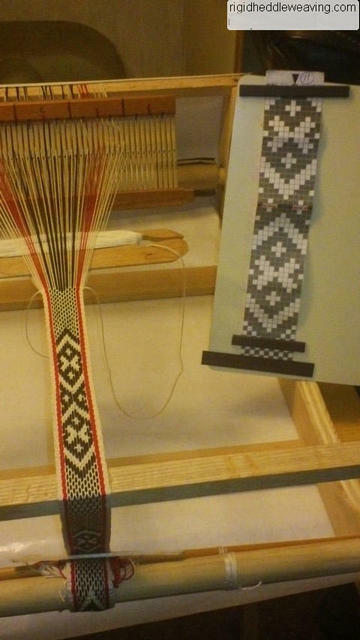 I have some additional articles on inkle weaving Here. Great idea! !Not all can afford both rigid and Inkle looms.For us who can't, we'll appreciate more posts on using rigid heddle loom for various Inkle loom weaving if you can please oblige us.Thanks for your brilliant idea. I recently began weaving narrow bands on my rigid heddle loom, which I really prefer to my Inkle loom. Do you have any tips for adapting Inkle patterns so that they can be used with a rigid heddle? Use the same patterns. Just reverse the open and heddled position of the threads. Where it says opened or unheddled, put that thread through a hole (the heddle of the rigid heddle). Where it says heddled, put that thread through the slot (the space between the heddles of the rigid heddle). What reed did you use and what yarn? With inkle weaving, the size of the reed doesn't matter since you're not using it to push the weft into the fell, but I believe I used a 10 dent reed here. I used #10 cotton crochet thread for this project. Hope that helps! Do you use a heavier yarn for the warp to make it warp faced?